Harold Dahl was born in Champaign, Illinois, on 29 June 1909. Dahl joined the U.S. Army Air Corps in 1933, during which time he was commissioned to Second Lieutenant. In February 1936, Dahl was kicked out of the army because of compulsive gambling and civil court convictions. He then became a freelance pilot for a while before getting into trouble with some Los Angeles based gamblers. He fled to Mexico City where he flew airships, charter flights and ferried aircraft to Vera Cruz for shipment to the Spanish Republic. He served as a volunteer on the Government side during the Spanish Civil War and used the nom de guerre Hernando Diaz Evans. Andrés García La Calle was put in command of the 1a Escuadrilla. Initially it comprised three elements. The 1a Patrulla consisted of La Calle, José Calderón, Ramón Castañeda di Campo and Ben Leider, the 2a Patrulla comprised of Jim Allison, Frank Tinker, Dahl and José ‘Chang’ Sellés and the 3a Patrulla was made up of Luis Bercial, Esteban Ortiz, José Riverola Grúas and Gerardo Gil Sánchez (who joined the unit on 10 February). Capitán Roberto Alonso Santamaría took command of the new second Spanish I-15 escuadrilla, the 2a Escuadrilla, which was established at Los Alcázares and San Javier. From there they moved to El Soto airfield, again on the Madrid front. The new escuadrilla comprised tenientes Rafael Robledano Ruiz, Juan Comas Borrás (posted in late February), Antonio Blanch Latorre, Ricardo Rubio Gómez, Mariano Palacios Menéndez, Ángel Álvarez Pacheco, Justo García Esteban and Hipólito Barbeito Ramos, sargentos Manuel García Gascón, Alfonso Calvo Ortiz, Cándido Palomar Agraz and Rafael Magriña Vidal and Uruguayan teniente Luis Tuya. On 7 February, the 1a Escuadrilla moved to the old Hispano-Suiza aerodrome in Guadalajara. They began operations at El Jarama, where their activities were outstanding, but their losses heavy; José Calderón, Ben Leider and Luis Bercial were killed, while Jim Allison and Dahl were shot down but survived. 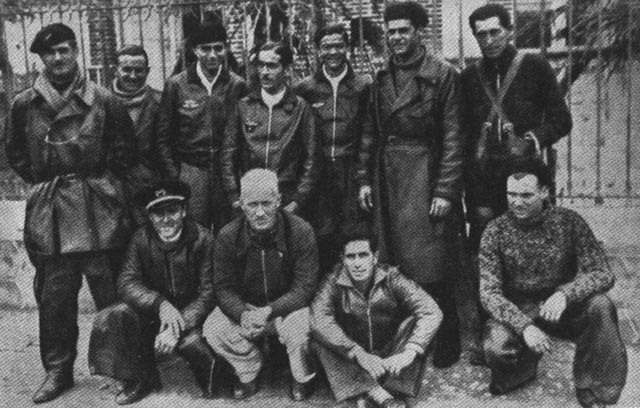 Back row from left: Frank Tinker, mechanic, José Riverola Grúas, Gil, Castenada, Captain Andrés García La Calle, Velasco. Front row from left: Bastido, Dahl, Pepito ’Chang’ Sellés, Lecha. In the early morning on 18 February, two Nationalist Ro.37s (flown by Spanish pilots) took off, followed by three Ju 52/3ms escorted by the Spanish Patrulla Azul and the Italian Fiat Group (totally 25 CR.32 including the Spanish). When they arrived over the front at Jarama, the CR.32s turned so that they were patrolling parallel to the front, while a large formation of Polikarpov fighters waited on the other side. When the Ro.37s and Ju 52/3ms were safe and returning, capitán Joaquín García Morato broke formation and, followed by teniente Julio Salvador Díaz-Benjumea and capitán Narciso Bermúdes de Castro, launched himself into Soviet fighters near Arganda. Disregarding recent orders restricting them from engaging superior numbers of enemy aircraft, Italian pilots Tenente Corrado Ricci, Tenente Enrico Degli Incerti, Capitano Guido Nobili and Fiacchino went to the assistance of their Spanish comrades by leading their respective flights against the large Republican formation of Polikarpov fighters. Finally, the entire group took part in the battle, fighting a reportedly 21 I-15s and 18 I-16s, and the Italians claimed for four 'Curtiss fighters' destroyed and five probables, as well as six Ratas destroyed and two probables. One I-16 and two probable I-15s were claimed by Tenente Enrico Degli Incerti while Sergente Maggiore Silvio Costigliolo claimed an I-15 in the Arganda area. Sergente Maggiore Guido Presel claimed two I-15s and a probable and Sergente Maggiore Brunetto di Montegnacco claimed two I-16s. Among the Spaniards, Capitán Morato, who returned with damage to his fighter, was credited with an I-15 and another as a probable while teniente Salvador was credited with and I-16 and a second fighter as a probable. Jim Allison and Dahl followed Leider down after the Nationalist fighters. Allison shot down his intended victim before three enemy fighters reached him. Allison’s I-15 gave a jerk, then it executed a perfect Immelmann and headed back to base but he was forced to make an emergency landing. Allison had received a serious leg wound during the combat. Dahl prepared to trip his guns on a careless adversary when he noticed the same three enemy fighters flash past. Almost simultaneously, he became aware that his machine was not answering the controls. A glance back revealed that the entire tail of his fighter had been shot away. On 20 March 1937, the 1a Escuadrilla (”Escuadrilla La Calle”) took part in the last aerial combat during the battle of Guadaljara. They took off in four patrols, led by Andrés García La Calle, Dahl, Frank Tinker (CA-056) and the Guatemalan pilot Miguel García Granados, and were soon involved with three bombers and 20 Fiats. Granados patrol was jumped by the Fiats, which had been patrolling in a higher altitude, and in the first hail of bullets Granados was shot down. Tinker gained his second victory (M. Scala KIA? ), and from the two squadrons of fighters taking part five Fiats were destroyed. The Italians reported that a patrol of four Fiat fighters under the command of Capitano Mario Viola had taken off from El Burgo de Osma in the afternoon and subsequently bounced two I-15s flying at low altitude in the vicinity of Almadrones. Sergente Maggiore Brunetto di Montegnacco shot one of the aircraft down in flames in spite of his opponent’s violent evasive action, the pilot taking to his parachute and being captured. Montegnacco’s victim was Miguel Garcia Granados, who suffered burns to his face and one hand and he was captured (he later returned in a prison exchange). Granados (1896-1968) was a former Colonel in the Guatemalan Air Force who had done a famous goodwill flight in 1929 from Washington DC to Guatemala. He had previously commanded the Guatemalan air force, with the rank of colonel, between 1930 and 1933. He had also served with the Paraguayan Air Force in the Gran Chaco War. The Russian pilots in this escuadrilla included Evgeni Antonov, Ivan Karpov, Georgii Masterov, Mikhail Petrov, Leonid Rybkin, Anatoly Serov, Nikolai Sobolev, Sergei Shalyganov and Mikhail Yakushin. The 1a/26 was completed by pilots of different origin; three Spanish, two Austrian, two Americans (one of them was Dahl) and the Yugoslav Bozidar Petrovich. It is also known that Leitenant Leonid Rybkin served as a Patrulla leader and Dahl was part of this Patrulla. Another Patrulla leader was Evgeni Antonov. On 13 July, Feldwebel Peter Boddem of 2.J/88 (Bf 109B) claimed an I-16 in the course of an hour-long air battle which also saw Feldwebel Braunschweiger (6-13) and Oberfeldwebel Fritz Hillman claim an unconfirmed I-16 each. It is possible that one of these claims (possibly Boddem) was Dahl, who was shot down and taken prisoner during the day. Dahl was tried and sentenced to death together with radio/gunner Aleksei Fedorovich Cherkasov, who had been shot down in an SB the day before. The sentence was commuted and he remained in a Spanish prison until 1940, when he was allowed to return to the US. Dahl is reputed to have claimed 5 biplane victories during his time in Spain. When he returned to the US he found out that his wife, Edith, had divorced him. Dahl spent several months of rest a relaxation before going to Canada to join the Royal Canadian Air Force where he became a commissioned officer. He served with the RCAF with distinction throughout WW II and remarried. After the war, Dahl was cashiered out of the RCAF for selling equipment, which had not been declared surplus. He went to Venezuela for a short time before signing on to join Swissair in which he flew the Geneva to Paris route. He got into trouble again in 1953 when a gold bar turned up missing on one of his flights. He was arrested and sat in prison for months awaiting trial. He was released during his appeal and ordered to leave Switzerland. 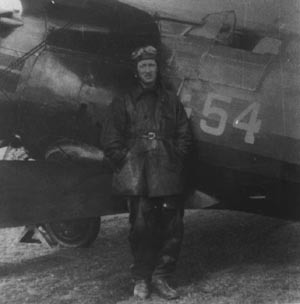 Dahl returned to Canada and became a bush pilot. On 14 February 1956 Dahl died in a fatal crash in the DC-3 he was piloting near Fort Chimo, 800 miles north of Quebec, Canada. Additional information kindly provided by Simon Buckley, Eugenio Costigliolo and Mikhail Zhirokhov.